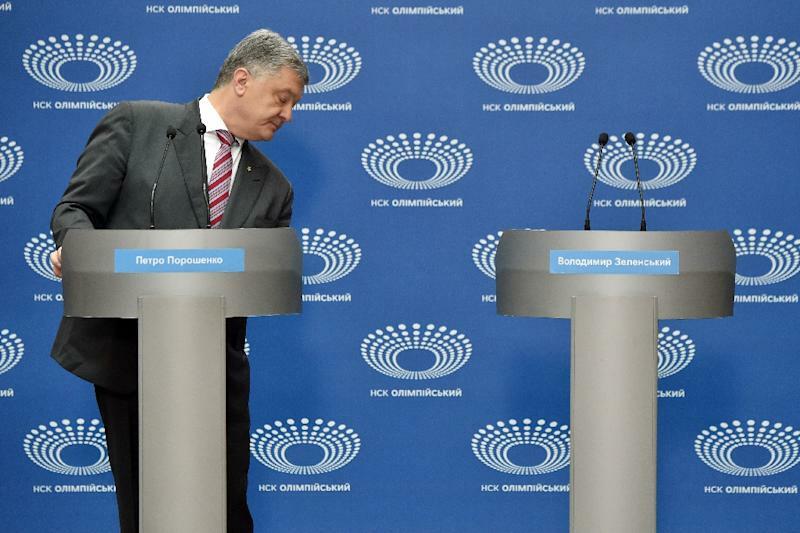 Kiev (AFP) - Ukraine's leader on Sunday held a one-man debate next to an empty lectern, roused thousands of supporters at a stadium and even sang, as a comedian tipped to become the next president skipped the event before a high-stakes run-off vote. A week before the second round of voting, President Petro Poroshenko failed to lure his rival Volodymyr Zelensky for a policy debate and chose to walk it alone at Kiev's Olympic Stadium as several thousand supporters flooded a nearby square. Outside the sports arena that seats 70,000 people the Ukrainian leader's supporters chanted "Poroshenko." Poroshenko, a 53-year-old tycoon who came to power after a popular uprising in 2014, has been eager to spar with the 41-year-old political novice and accused his rival of avoiding hard-hitting questions. He said he would respect the "choice of the Ukrainian people" if Zelensky were elected president on April 21 but added he was worried for the country's future. "I must say: Ukraine's fate is in danger," he said during his hour-long appearance at which he also took questions from reporters. Zelensky has said he is ready to spar with the president next Friday, two days before the vote. Support for the comedian among voters has doubled to 61 percent since the first round of voting, with Poroshenko on 24 percent, according to the Rating pollster. After the "debate" Poroshenko climbed onto the stage outside the stadium where he attempted -- along with musicians -- to perform a rendition of a humourous folk song about a man who is stood up by a woman. 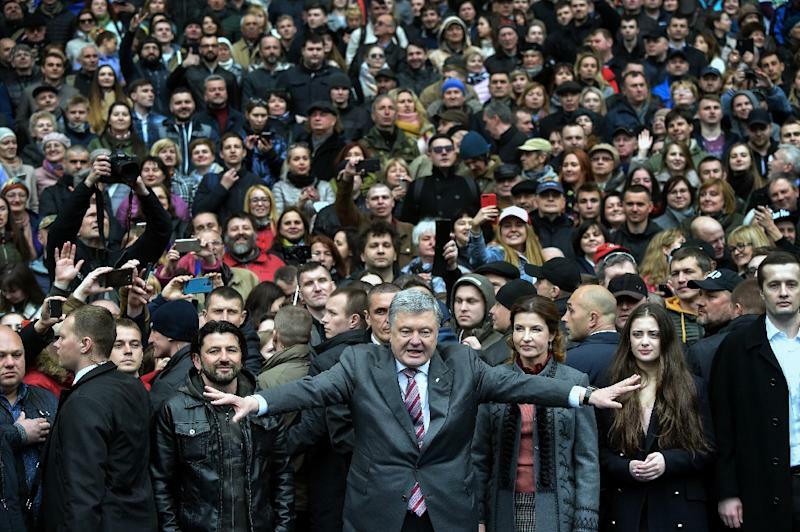 "I've come, you are not here, you've deceived me, you've let me down," a smiling Poroshenko and the musicians sang as the crowd clapped. The president then led his supporters into the stadium where they performed the national anthem and took pictures. 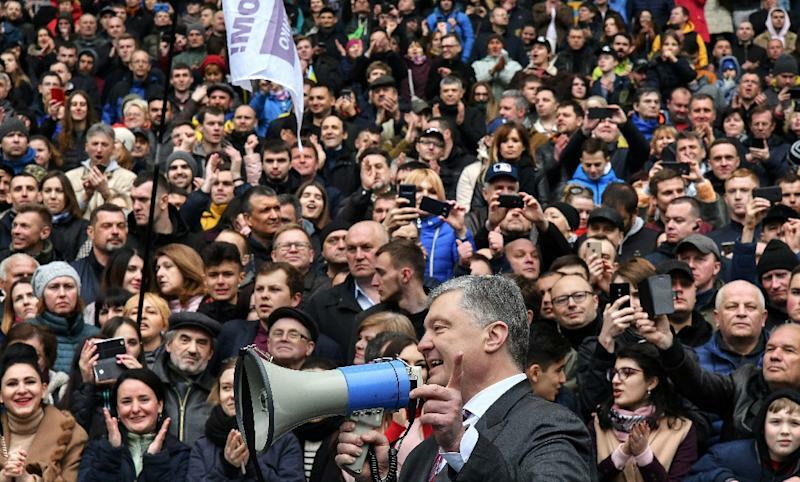 Armed with a loud hailer, Poroshenko roused his backers with chants. Some women cried and many embraced each other. Many said they did not want Zelensky to become the next head of state. "I've come here to defend the interests of our country," said a serviceman who identified himself by his nom de guerre, Batya UNSO. "If the rival -- this buffoon, clown, jester, harlequin -- wins, then we will all have to hang ourselves," he told AFP. Some pointed to Zelensky's inexperience and ties to oligarch Igor Kolomoysky, who owns the channel that broadcasts the entertainer's shows. "After the first round of voting the situation risks becoming catastrophic," said Oleksandr Misyura, 59. "Who is Kolomoysky? He is Ukraine's biggest kleptocrat. We need to save the country." Police said that up to 5,000 people turned up at the stadium. The presidential campaign has descended into farce at times, with both men undergoing drugs tests at Zelensky's insistence. Over the past few days the vote rivals have traded insults and sparred bitterly in a phone exchange broadcast on television. The stakes are high for the country of 45 million people seen as a buffer between the European Union and Russia. Ukraine is mired in a smouldering war with Moscow-backed separatists in the industrial east. The conflict that broke out after a popular uprising ousted a Kremlin-backed president and Russia annexed Crimea in 2014 has cost some 13,000 lives.